The FBI is investigating how activists linked to the Anonymous network managed to intercept a conference call between British and US police in which they discussed legal action against hackers. Anonymous has released a tape of the call in which detectives give details of alleged hackers being tracked. The FBI said the information had been obtained illegally. Later, it emerged Anonymous had also hacked the websites of US police forces and the Greek justice ministry. The FBI said in a statement: "The information was intended for law enforcement officers only and was illegally obtained. A criminal investigation is under way to identify and hold accountable those responsible." London's Metropolitan Police's central e-crime unit said the matter was being investigated but that no operational risks had been identified. Anonymous is a loose collective of "hacktivists" which has been responsible for cyber attacks on various companies, governments and individuals in recent years. Anonymous describes itself as an "internet gathering". The term is used to describe a collective of people who come together online, commonly to stage a protest. The groups vary in size and make-up depending on the cause. Members often identify themselves in web videos by wearing the Guy Fawkes masks popularised by the book and film V for Vendetta. Its protests often take the form of disrupting websites and services. Its use of the term Anonymous comes from a series of websites frequented by members, such as the anarchic image board 4Chan. These allow users to post without having to register or provide a name. As a result, their comments are tagged "Anonymous". In the past, groups have staged high-profile protests against plans by the Australian government to filter the internet and the Church of Scientology. Many Anonymous protests tackle issues of free speech and preserving the openness of the net. The recording of the conference call - said to have taken place on 17 January - was posted on YouTube, along with an email allegedly sent by the FBI to law enforcement agencies in various countries giving details of how to dial in to it. It invited them to "discuss the on-going investigations related to Anonymous, Lulzsec, Antisec, and other associated splinter groups". It was unclear how Anonymous obtained the recording, but a lawyer for one of the suspects discussed in it told the BBC it appeared to have been taken as an audiofile from an intercepted email, rather than having been eavesdropped on. A comment on one of the Twitter accounts linked to Anonymous, AnonymousIRC, said: "The FBI might be curious how we're able to continuously read their internal comms for some time now." The recording features about five men calling from the UK, Los Angeles and Washington, who discuss in detail the ongoing investigations into hacking and action being taken against suspects. Among them are several British men accused of being behind cyber attacks in the US and UK. The police give the online pseudonyms of suspects but the real names have been bleeped out of the recording. When the British detectives discuss delaying some arrests while US investigations are being carried out, the FBI agent thanks them for their co-operation. The British detective replies: "We're here to help. We've cocked things up in the past, we know that." BBC security correspondent Frank Gardner says the recording will be highly embarrassing for the cyber crime detectives. 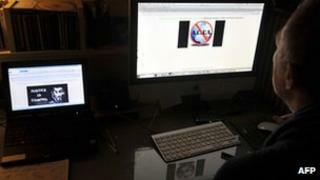 Later on Friday, Anonymous said it was behind an attack on a police website in the US city of Boston. A message posted on the site before it was taken down said it had been targeted in response to "police brutality" towards the Occupy Wall Street movement and warned there was "plenty more mayhem to deliver". Meanwhile police in Salt Lake City, Utah are investigating a cyber attack on Tuesday on a site used by residents to report crimes. The site was taken down and Detective Dennis McGowan said police were "knee deep in trying to get a feel for the extent of the problem". Hackers operating under the Anonymous name also took over the website of Greece's justice ministry on Friday in a protest against the country's signing of a global copyright treaty and the government's handling of the economic crisis. The website was replaced with a video of a figure wearing the symbolic white mask of Anonymous supporters, saying: "Democracy was given birth in your country but you have killed it."